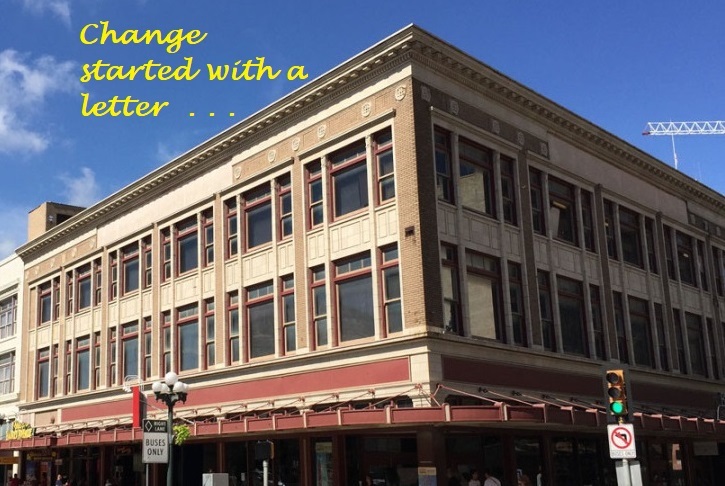 PRESERVATION ALERT – New Historical Designation Under Review! Contact the Texas Historical Commission – help support our State Antiquities Landmark nomination! Mary Lillian Andrews believed in the power of a letter. On March 7, 1960, Mary Andrews, a college freshman and NAACP youth leader, sent letters to the managers of local downtown stores requesting that they end racial segregation at their lunch counters. Her courage and conviction sparked the negotiations that led to San Antonio’s peaceful and voluntary integration of downtown store lunch counters, including Woolworth’s, on March 16th, 1960. At a time when sit-in protests across the South often met with violent resistance, San Antonio became known for setting a positive example for the country. Because the current Alamo plan suggests the Woolworth Building’s demolition is an option, the Society has nominated it for designation as a State Antiquities Landmark (SAL). This designation will recognize the building’s individual significance as a Civil Rights site of national importance and provide additional legal protection under the Antiquities Code of Texas. Your letter, or e-mail, to the Texas Historical Commission in support of our nomination can help protect the endangered Woolworth Building as a visible link to our city’s important Civil Rights legacy. Not sure what to say? Feel free to use this handy form letter (you must print and mail, or copy and paste to e-mail – don’t forget to sign! This form does not submit online). Please contact Beth Standifird at bstandifird@saconservation.org or 210-224-6163 with questions. Join us as we work with our partners in the Coalition for the Woolworth Building to preserve this important civil rights site. Contact the state officials listed at the bottom of this page. Tell them you support reusing the Woolworth Building as part of the new Alamo museum. Follow the link below to learn why saving the building is vital to an authentic Alamo Plaza experience. What happened at Woolworth’s in 1960 and why should you care? The peaceful voluntary integration of lunch counters in San Antonio set an example for the nation in positive race relations. As part of a student-led movement across the segregated South, it helped bring about the passage of the 1964 Civil Rights Act. Today, the Woolworth Buildings stands as a visible link to this important civil rights achievement. It also represents a vital aspect of Alamo Plaza’s rich, but little-known Black history. The Coalition for the Woolworth Building is a grass-roots advocacy group. We support the preservation of the Woolworth Building and want to build on its presence in Alamo Plaza to share an integrated history that includes African-Americans. Members include: San Antonio African American Community Archives and Museum; Esperanza Peace and Justice Center; Westside Preservation Alliance; Concerned historians, civic leaders, and community members; and the San Antonio Conservation Society. Your voice makes a difference! Make your voice heard on the issues that matter most to you.